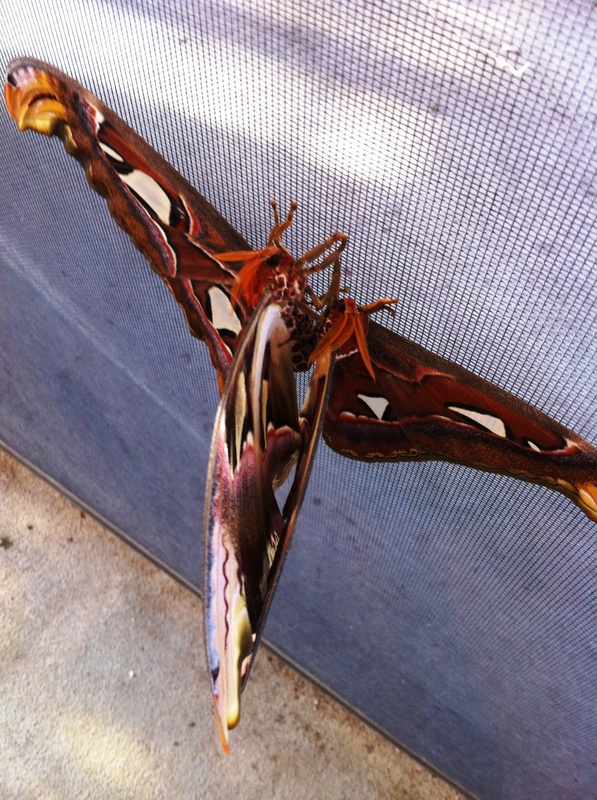 The Atlas moth (Attacus atlas) is a large moth belonging to the Saturniidae family. 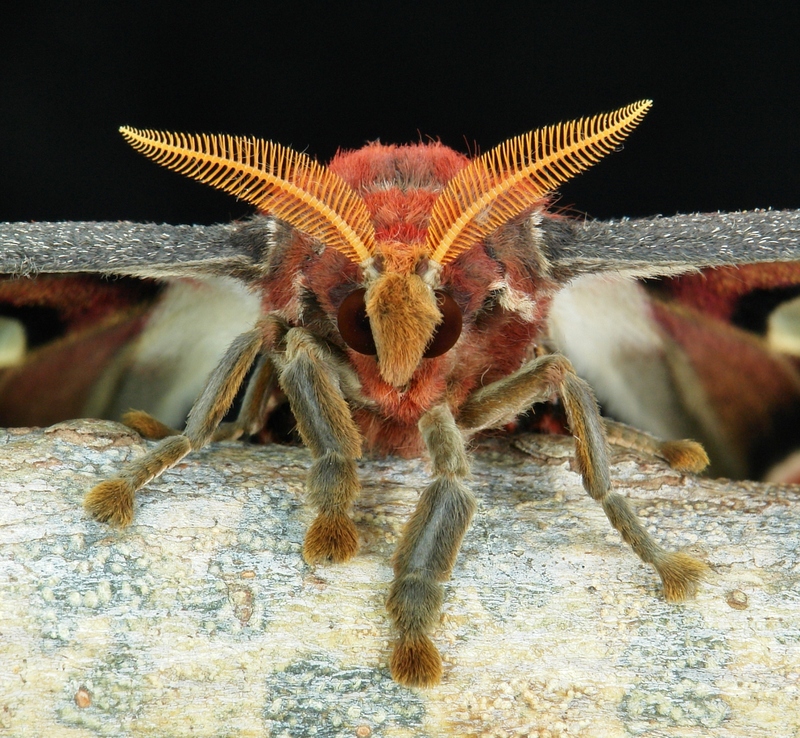 Saturniids, familiarly called giant silk moths, include some of the largest species of Lepidoptera (moths and butterflies). Two local species that may be familiar to readers are the polyphemus and luna moths. Atlas moths are considered the largest moths in the world in terms of total wing surface area. Their wingspans are also among the largest, often reaching over 10 inches. They are strikingly beautiful, with tawny wings punctuated with translucent “windows” bordered by black. Their most distinguishing feature (other than their size) is an extension of their forewings that resembles a snake’s head, thought to be a means of scaring off potential predators. These spectacular moths make superb additions to the Cockrell Butterfly Center. During the day, they spend most of their time motionless, clinging to the side of a tree or other surface. Visitors can thus get up close to intimately study these creatures, and can clearly observe their fat, furry bodies, fuzzy antennae, and teddy bear like expressions. 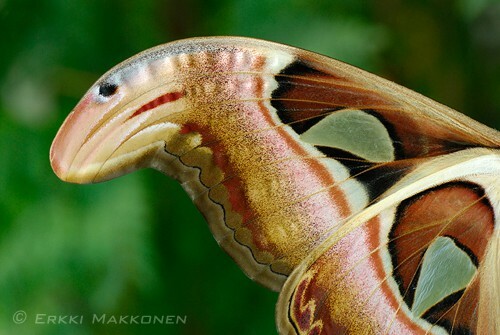 Once night falls, the male Atlas moths take flight in search of a female. The search has a sense of urgency, as adult Atlas moths typically live only about one week. This is because the adults do not have fully formed mouth parts and therefore cannot eat; they are sustained only by the fat reserves they built up as a caterpillar. The moths will quickly mate, lay eggs, and die soon after. One day at the Cockrell Butterfly Center, a male and female emerged from their cocoons around the same time. We took the opportunity to breed and raise this species of moth. The newly emerged male and female were placed in a flight cage in the greenhouses on the top level of the museum parking garage. They paired the very first night they were together. During mating, the moths remained coupled for several hours. Then, over the next three days, the female laid approximately 150 crimson eggs, placing them indiscriminately along the walls and edges of the flight cage. A mating pair of Atlas moths clinging to the side of a flight cage. The larger of the two is the female. Atlas moth larvae are generalists, meaning they will feed on a wide variety of host plants (but not all plants). Hoping to determine which of several possibilities would be the best food for our caterpillars, we searched the literature for recorded host plants. We chose four that we had available, including Camphor Tree (Cinnamomum camphora), Vitex (Vitex trifolia purpurea), Mahogany Tree (Swietenia mahoganii) and Sweet Potato Vine (Ipomoea batatas). Gathering the eggs, we divided them among four plastic containers lined with moist paper towels and ventilated with tiny holes poked in the lid, each containing a different kind of leaves. The eggs took 10 days to hatch. The hatchling larvae were covered in pale protuberances and had black heads. After eating their eggshell, the tiny caterpillars began eating the provided foliage. Once the caterpillars were feeding reliably, they were moved to netted cages containing potted plants, so the leaves would be constantly fresh. 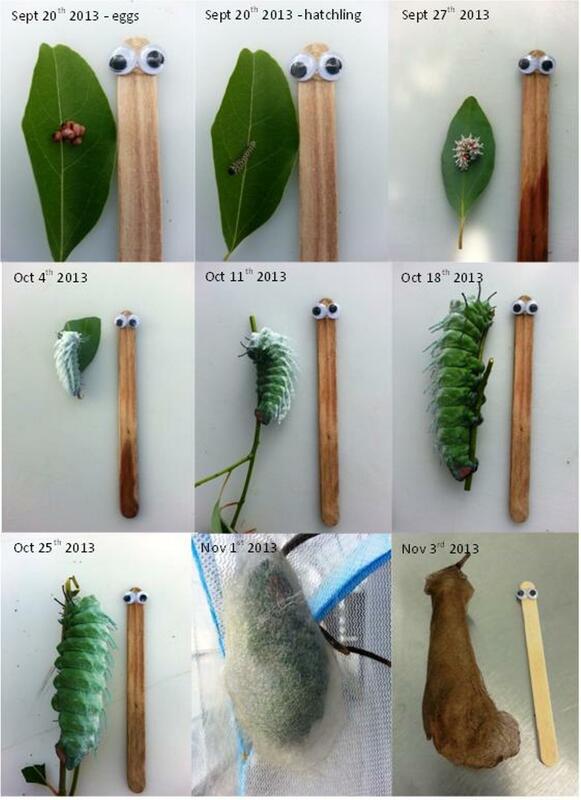 The caterpillars hatched on a Friday in September. To track their weekly growth and development, we took a photograph of them each Friday thereafter. It quickly became obvious that the caterpillars on Camphor were thriving: they grew bigger and faster than their siblings on the other plants (the pictures shown below are of larvae fed on Camphor). In each photograph, larvae were placed next to a standard sized Popsicle stick, fondly known as “Size Reference Ralph,” to track their relative growth. The caterpillars took six weeks from hatching to pupation. They ate voraciously, becoming soft and fleshy to the touch, and were a pale blue-green color. Their backs were covered in a Mohawk of tubercles with a thick, waxy, flaky coating. After six weeks, the caterpillars were almost as long as Size Reference Ralph and were quite pudgy. The sequential pictures show the dramatic changes in the larvae, followed by the start of silk spinning, and finally a complete cocoon. Once they finished their cocoons, the larvae pupated inside. We then gently moved the dried cocoons to the emergence chamber inside the entomology hall of the Butterfly Center. Then we waited. Atlas moths may eclose from their cocoon in as little as three weeks, but can sometimes take several months. To escape from their silken enclosures, they must excrete a substance that dissolves a hole in the silk, allowing them to crawl out. They then cling to their cocoons while their wings expand and dry. The first Atlas moth of our batch of cocoons emerged on Dec. 17, almost 3 months after hatching from the egg. It was a large female, with a wingspan of just over 10 inches. As you can see, Size Reference Ralph was dwarfed by her! 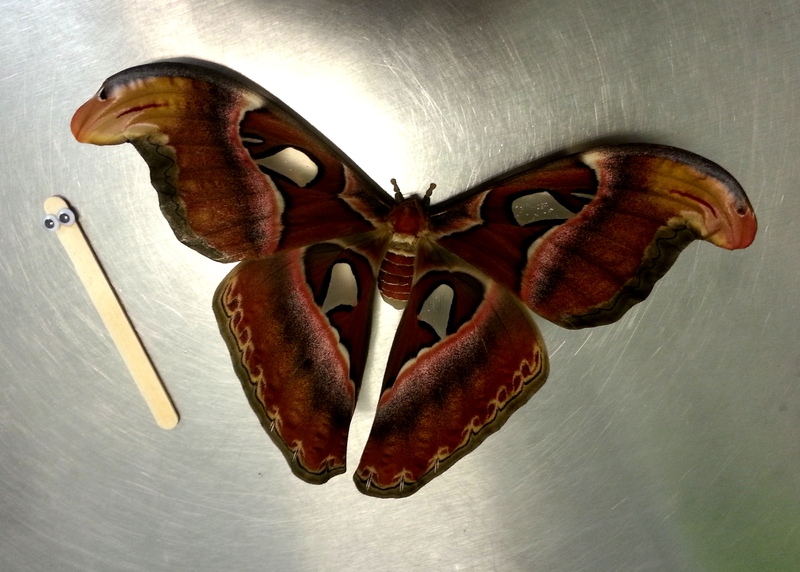 Our first Atlas moth to emerge on Dec. 17, 2013 (picture courtesy of Lauren Williamson). Know a girl who’s interested in math and science? Come to GEMS (Girls Exploring Math & Science) on Sat., Feb. 8 from 9 a.m. to 1 p.m. The Museum will be filled with hands-on science and math for everyone to experience. Local professionals will be at the Museum to answer questions about their careers in the fields of science, technology, engineering and math. The event is free with paid admission to the Museum. Click here for $7 admission to all permanent exhibit halls on Sat., Feb. 8. Great Job Celeste…..nice article and photos. The Atlas moth was a hit with the guests who visited the Butterfly Center earlier this week! Please keep posting these informative articles regarding various species of moths and butterflies! I get many questions about butterflies and am always looking for more information to provide guests with. Hi Lauren, Sorry…..I forgot to mention great job to you also for the photos. I am a intermediate level macro photographer wanting to take pictures like you have on the website. Do you have any advice on how I could work with your moths or butterflies? For example, when would be a good time of year, and day, to come and take photographs? Do you normally allow photographers access to areas that may be quieter than those the general public use? I am open to any ideas you may have. Thanks. My daughter and I have been wanting to raise these guys, but we don’t know if it requires a license to grow them in the US. We found a supplier in the UK, but they mention providing the license info. Google search turns up nothing. Where could I find out more? i really didn’t like it ??? To Ben Rogers and his daughter. What did you find out about getting yourself legal to raise atlas Atticus in the US? I know this is late in coming, but here in the US you need to get a permit (P526) from the USDA. Go to their website and create an account. You need to physically go to a local field office with government ID to verify yourself before an agent, then complete the process online to get a “level 2” account. Once you have this, apply for the permit and fill out all the forms. It takes about 2-3 months to get approved. The permit will come with very specific terms, and you must file a 6-month follow-up report of all your activities as long as you have the permit. I get my cocoons from the Denver Colorado office of the London Pupae exchange service. Great write up and awesome photos! Actually, I am currently working a project on Atlas Moth and I would like to obtain your permission to use your photos (with proper accreditation) for my project. Please contact me at my email provided! Look forward to hearing from you!